This is a great article by Cedric X. Bryant, Ph.D., with simple strategies to add steps to your day. All it takes is a little forethought and we could all hit that 10,000 steps-a-day mark. The steps you take while walking to work or during phone calls can reduce your risk of heart disease and other deadly diseases. 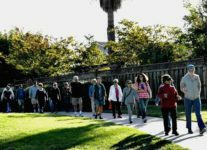 Last week, the surgeon general launched a national call to action to promote walking and walkable communities, calling on people to make walking a priority and to make the United States a more walkable nation. cardiorespiratory system by getting your heart pumping helps maintain your functional mobility and is possible to do just about anywhere without any specialized equipment. Walking for 30 minutes a day, five days a week can help change your body and life. Benefits from incorporating walking into your daily routine include reduced risk of heart disease and diabetes, better mood, more energy, lower blood pressure and weight loss. Even if you already hit the gym or perform some other type of a regular workout, the latest research suggests sitting too much is potentially more dangerous than smoking. Other research links a lack of physical fitness with the stiffening of arterial walls (an early sign of cardiovascular disease) in kids as young as 6. The good news is that just five minutes of movement every hour can help reduce some of the risks associated with physical inactivity. Here are 10 easy strategies to help you get started. 2. Invite a friend, spouse or child for a walk. Burn calories while building stronger relationships with the people you care about. It’s a win-win. 3. Walk, don’t sit, during your child’s activities. If your child is at dance class or soccer practice, don’t sit in the waiting area or on the bleachers. Take a walk around the field, gym or neighborhood. 4. Invest in a wearable activity device. From simple pedometers to more high-tech activity monitors, such as a Fitbit or Apple Watch, these devices can motivate you to move more. See how many steps you take in a typical day and then set attainable goals to gradually increase that number over time. 10,000 steps is a common and good long-term goal. 5. Squeeze in a walk with a colleague at lunch. Incorporating a walk at lunch during the workday can help make you more productive and boost creativity. You’ll also burn a few extra calories in the process. 6. Park once – and only once. While out running errands, park your car in a central location and walk to all of the stores instead of driving. If your bags get too heavy, return to your car and drop them off to get in the extra steps. As an added bonus, you’ll also save on gas. 7. Walk part of your commute. Many cities offer “park and ride” locations. Find one a little distance from work, park there and walk the rest of the way in. You’ll feel energized and ready to take on the day. 8. Rearrange your route. Change up your walking routes and explore different areas nearby. Instead of always starting from your home, begin your walk from a friend’s house, the grocery store or the office. Anywhere you find yourself at least once a week is a possible starting point. You’ll also notice a lot more while exploring new areas on foot. 9. Take work meetings outside. Conversations can be easier in person than on the phone or over email since it reduces the likelihood for misinterpretation and helps you build relationships with your colleagues. If you must take a long phone call, try doing so while walking around the office wearing a headset. 10. Hold a walking challenge. Get your friends or colleagues excited about walking too with a fun walking challenge. It doesn’t have to be complicated or expensive, and there are plenty of people who love the opportunity to get out there and strut their stuff. Pick a free mobile app that everyone can use to keep track of steps, miles or minutes walked as individuals or teams. The winners will get plenty of recognition and bragging rights! Most experts agree that any amount of walking – even a few minutes – will benefit you. It’s much like loose change: It all adds up at the end of the day. So what are you waiting for? Get out there and step up your walking routine.